NEW YORK — After seven straight draws, we’ve finally witnessed a decisive result at the World Chess Championship. Sergey Karjakin of Russia, the challenger, claimed the first full-point on Monday against titleholder Magnus Carlsen of Norway. Game 8 was dense and difficult, and with the white pieces, Carlsen may have pressed too hard beyond what at one juncture looked like another draw. 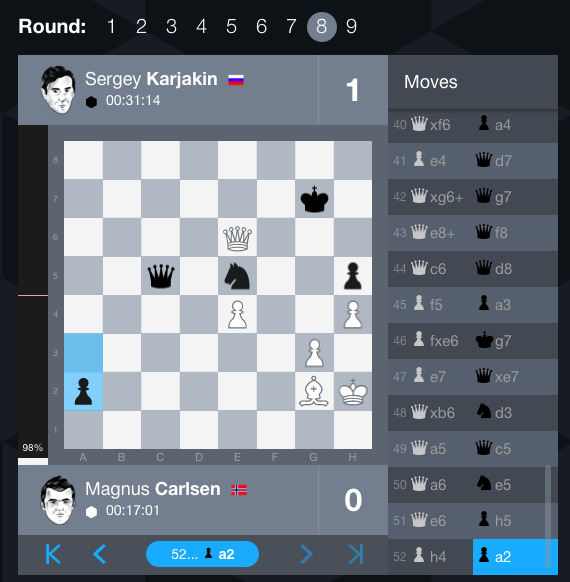 The opening was a fairly staid and initially symmetrical Queen’s Pawn game — nothing surprising for Carlsen, who has in the WCC so far adopted a strategy of boring openings, aiming to test Karjakin in the middle and endgames. Carlsen had dodged a few bullets in previous games, but his approach caught up with him in Game 8. Karjakin barely made the so-called “time control,” executing the first 40 moves in 100 minutes with just ten seconds to spare. Perhaps sensing the challenger’s stress, Carlsen pressed on past several drawing chances, but blunders on both sides made for a tense spectacle until Carlsen’s commitment to the win with white became his undoing on move 52. There’s simply too much for Carlsen to cover: the incoming potential knight check of the white king on g4, the black pawn on a2 tying down the white queen because that pawn threatens to put a second black queen on the board, and the black queen locking down the g1 square. It’s the definition of a hopeless position and evidence of how a draw can swing to win very quickly at this level. FM Mike Klein and GM Robert Hess break the whole thing down in far more authoritative detail than I can at Chess.com. Carlsen has real trouble now, and he knows it. He stormed out of the postgame press conference when Karjakin was delayed. With only four games remaining, Carlsen must win one to tie and another to retain his title, without going to tiebreaks. This is the big risk of racking up a lot of draws — the pressure is on the player who’s behind to catch up, with games running out. It was looking as if they 2016 World Chess Champion would be a drawfest. But just like that, it’s a whole new ball game. Karjakin now leads 4.5-3.5. Luckily for Carlsen, Tuesday is a rest day, with play to resume Wednesday at 2PM ET.